Different versions of Trainz a New Era may require different methods to register and authorise. The "Platinum Edition" comes with a Product Key that is used to both register your "Standard Edition" installation plus unlock the Bonus DLC content. Once unlocked, your bonus content will be available to download in-game next time you start Trainz (as long as you have your MyTrainz username and password entered in the Launcher and you are online)..
You will also have access to the Trainz Download Station and almost 500,000 additional items you can download free. 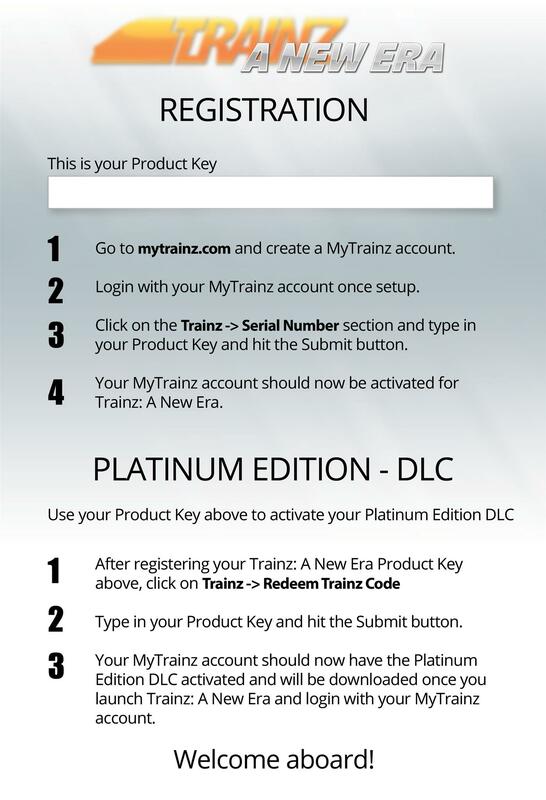 NOTE: If you already have a MyTrainz account, then you don't need to create a new one. If you already own TANE, you will still need to follow part two of the guide below to unlock the DLC items. Your DVD edition comes with a guide inside the box that includes your Product Key. You must enter your serial number into both locations outlined to have full access to the TANE Platinum Edition.